Wish a sweet moment to a wonderful couple! This romantic anniversary card reminds the happy couple to sit back and enjoy a special moment together. Remind them to take time for themselves and to nurture their love. The setting sun offers a warm golden light to the couple lazing in the hammock. It is the idyll setting for romance and the perfect anniversary card to spend to a loving couple. This love card, with its image of a couple embracing in front of a stunning sunset, serves a dual purpose. You can give it to another couple on their anniversary or give it to your dearest love. Or use it for both - this card is so lovely, no one could blame you. Whomever receives it will be reminded of joyous occasions with their significant other and they will be touched by its literally heartfelt message. Their love is undeniable...and once a year, you get a chance to wish them continued happiness together. 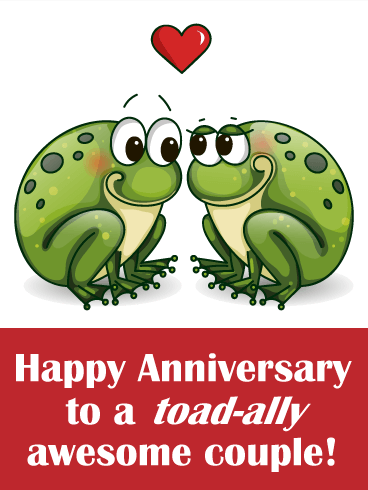 What better way than with this cute anniversary card for a "toad-ally" awesome couple. This pond pair looks lovingly at each other with a single heart above for a sweet & romantic touch. It's a fun way to let them know you're thinking of them. 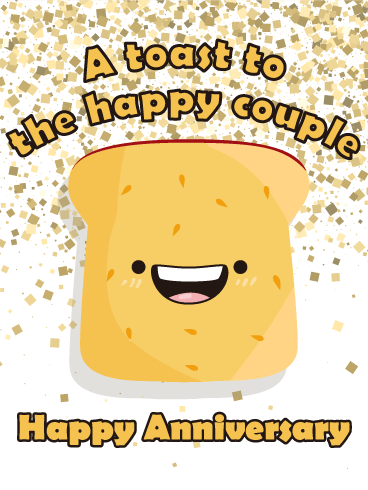 This is the kind of toast any couple would love to get on their anniversary! 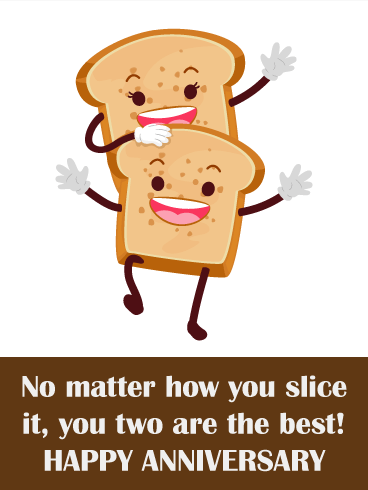 Both funny and sweet, it's the perfect card to send the happy pair as they celebrate another year together...no matter how you slice it! 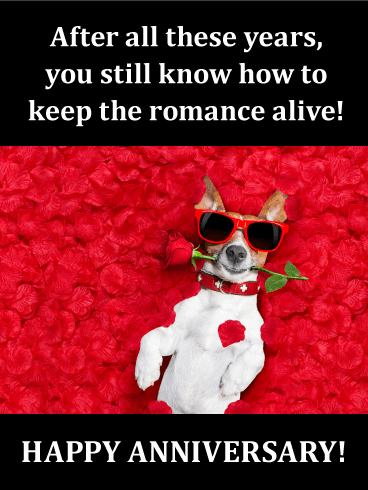 They say you can't teach an old dog new tricks...but why would you want to when he's this romantic? A love-struck pooch is surrounded by rose petals-including one between his teeth-which is the perfect way to let your special someone know that you can't wait to celebrate another year together. They go together like bacon and eggs...and they still know how to keep things sizzling! 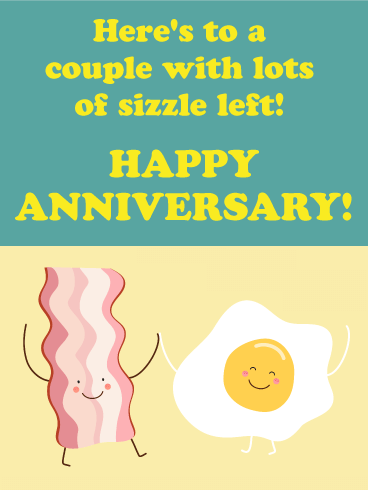 Let them know with this adorable anniversary card featuring everyone's favorite breakfast pairing. It's a great way to help celebrate a special couple in your life in a fun & playful way. Anniversary cards don't get any sweeter than this! Two mugs, complete with smiley faces, are filled with soft, mushy, heart-shaped marshmallows. The words are sentimental, with a little fun mixed in, making this a very romantic way to wish the one you love another year of warmth and happiness. 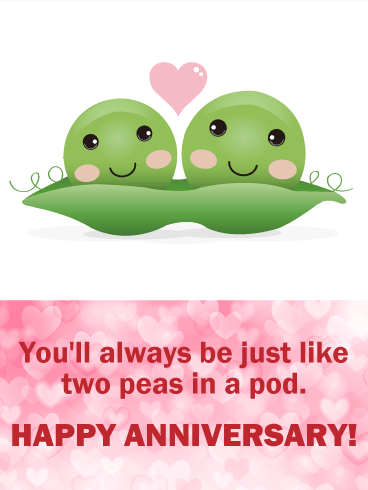 You love them to the core, and this playful anniversary card is the best way to let them know! These two cute apples can't keep their eyes off of each other, which is just how you feel about the apple of your eye. Send it along as a sweet surprise to that someone special. 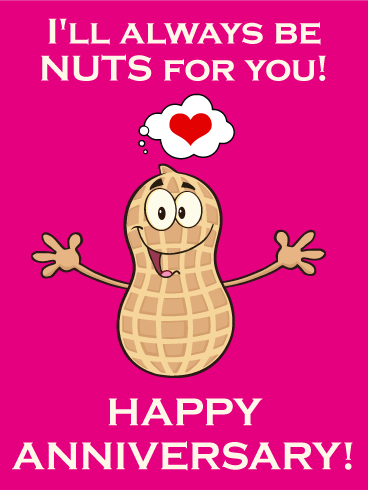 It's no secret how you feel about the one you love...and you'd be nuts to let this year's anniversary go by without letting them know! 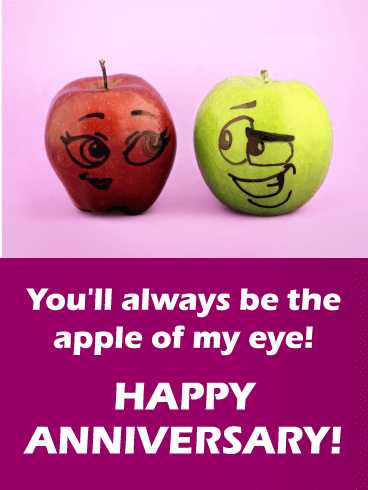 This anniversary card is humorous and heartfelt, and will have them blushing until next year! Some people are just meant to be. From the moment you met your loved one's significant other, you knew their relationship was something special. 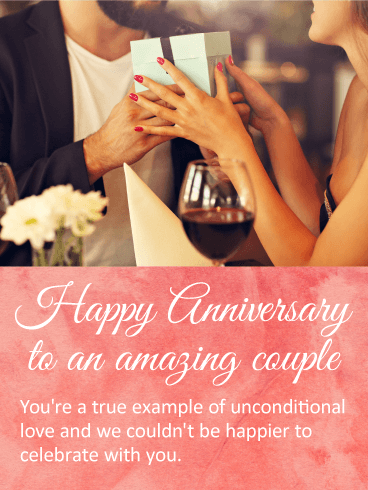 For your friend or family member's anniversary this year, send this sweet Happy Anniversary card to celebrate their special day! Show them that you think they are the perfect match, a couple that belongs together forever! Some people say toasts are just for fancy gatherings, but we say that any special occasion calls for a tribute to the people being celebrated. 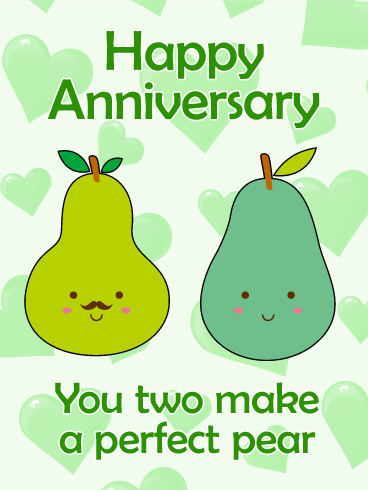 For your loved one's anniversary, send this anniversary card to show how happy you are for their celebration. 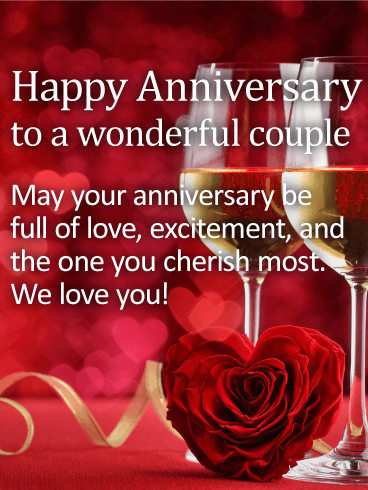 Use this special occasion to support their relationship and congratulate them on the love they found. Send it today! 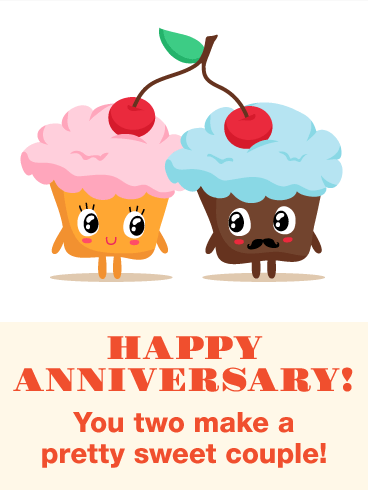 Could this anniversary card be any sweeter?! For starters, that picture is enough to make anyone melt. The words connect to the picture through the line, "Our hearts have become one", and that sentiment is just beautiful. Don't be surprised if this one leads to tears! 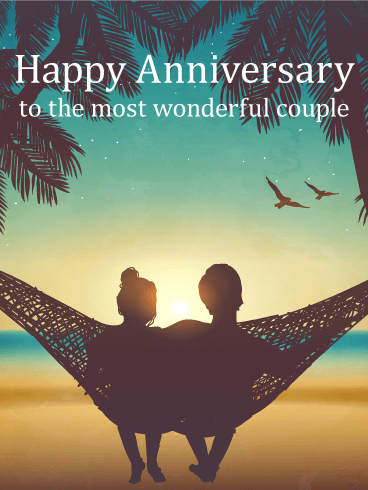 This anniversary card is the perfect choice for any couple in your life... parents, friend, siblings, in-laws, especially for anniversary parties or celebrations. It offers a great balance of fun and heartfelt sentiment. 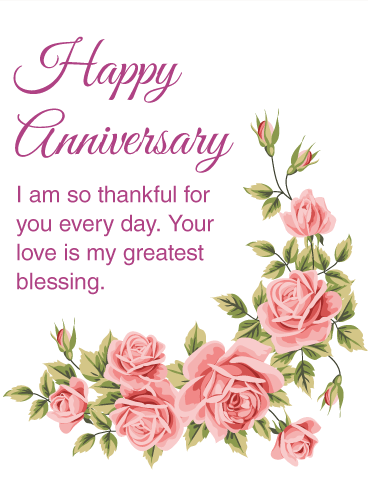 This anniversary card is a great choice for the happy couple celebrating an anniversary in your life. 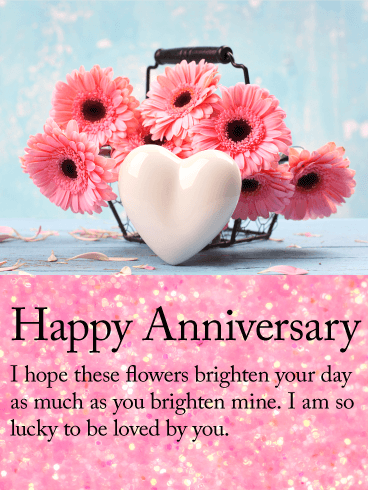 The bright colors make this anniversary card super fun, while the sentiment about watching love blossom is sure to make anyone smile. 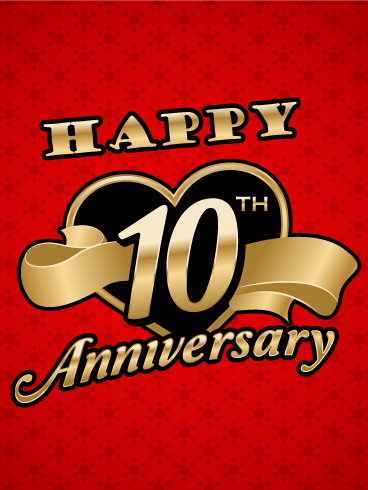 This simple, elegant anniversary card is a great option for anyone celebrating a 10th anniversary. 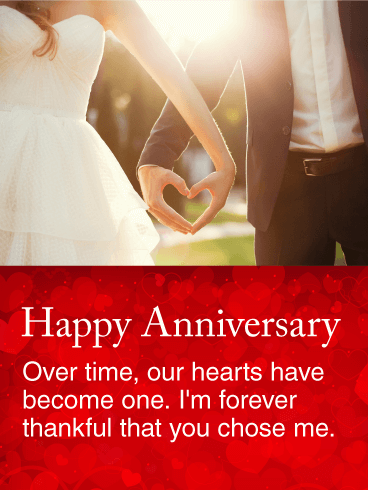 The gold and red make this anniversary card pop, and the simplicity allows you to customize the card for whoever it may be for. 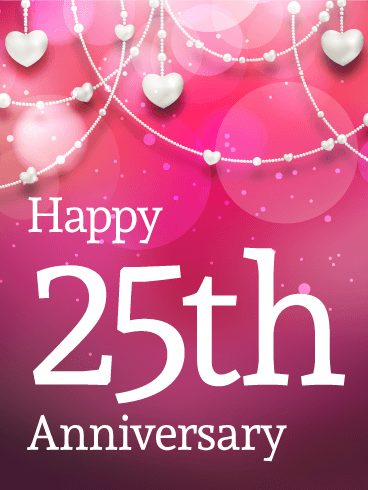 For anyone celebrating a 25th anniversary, you can't go wrong with this bright, exciting anniversary card. The string of hearts with celebratory balloons is tons of fun, while the general nature of the card allows you to customize it for any parents, friends, or family members you're celebrating. 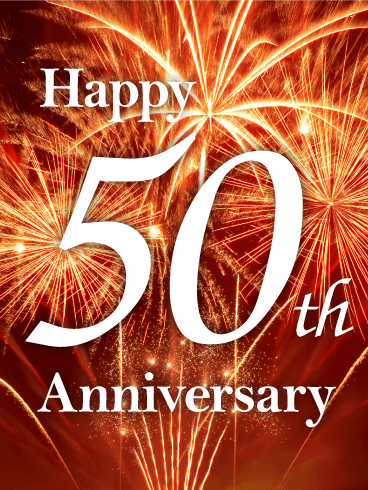 Is there a couple in your life who has made it to the incredible 50th anniversary milestone?! This anniversary card is the perfect choice. 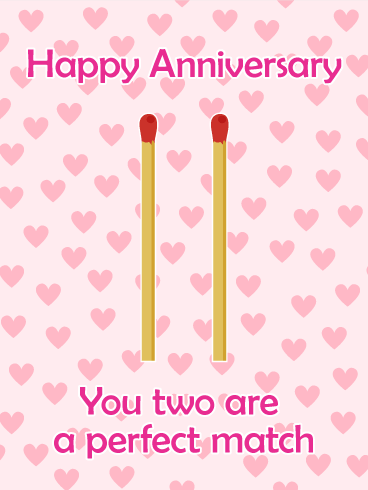 Though real fireworks may not be an option, celebrate your favorite couple with this exciting anniversary card and the same sentiment! The gold coloration of the anniversary card captures attention immediately, with its elegance and subtlety. Once you get past the picture, the words are just as subtly captivating. This is a great choice for any special couple in your life, especially at an anniversary party or celebration. Cheers! Do you have trouble expressing your love for the special guy in your life? Or maybe you just want to make him feel extra special. The adorable picture is sure to make him smile, and the kind words will make him smile from ear to ear. 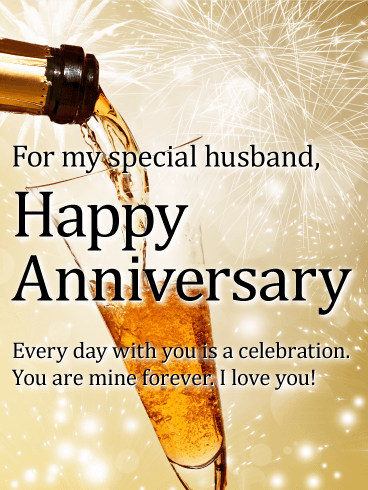 This anniversary card is a great choice for the special man in your life on your anniversary. It's fun, it's subtle, and heartfelt. The bright colors are eye-catching, and the words are sure to make any guy swoon. 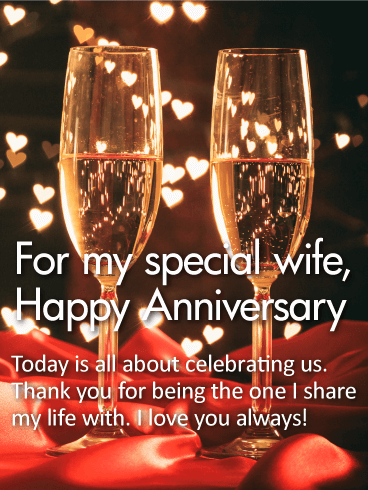 For your amazing husband, you can't go wrong with this anniversary card. The bright lights are sure to catch his attention, and the simplicity of the card allows you to customize it for your man. This is a great choice for your anniversary! 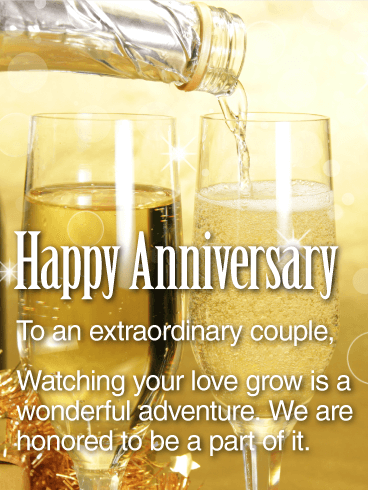 Pop a bottle of champagne and let's celebrate... with this awesome anniversary card! The picture is fun, the background is exciting, and the sentiment is sure to bring a tear (or lots of tears) to your husband's eyes. 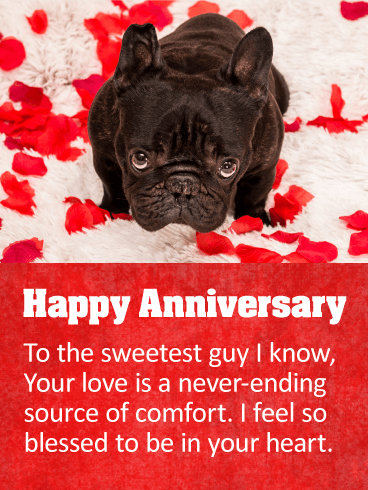 This anniversary card is perfect to let your amazing man know how you feel. If you haven't found the perfect card for your girlfriend or wife, look no further. 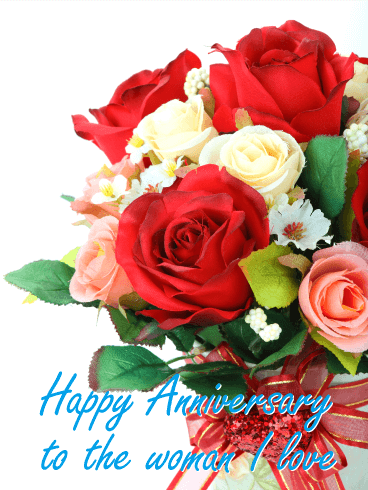 This anniversary card offers a nice touch of class, with the wooden backdrop and beautiful roses. The special girl in your life is more than your significant other; she's your best friend. 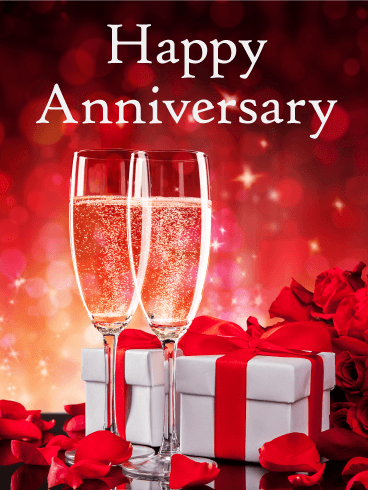 This anniversary card offers that sentiment, and more! Just look at those colors! 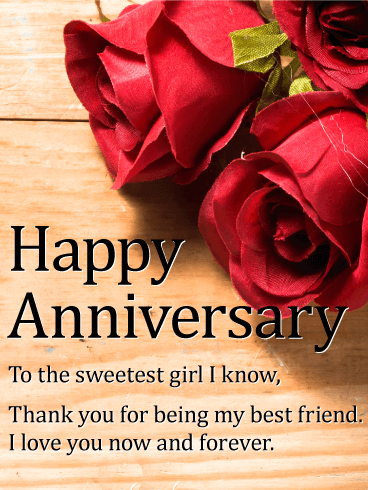 This sweet anniversary card is sure to bring a smile to your girl's face. It's simple but heartfelt, and the beautiful picture of the roses is perfect for your anniversary day. Who doesn't love a nice bouquet?! 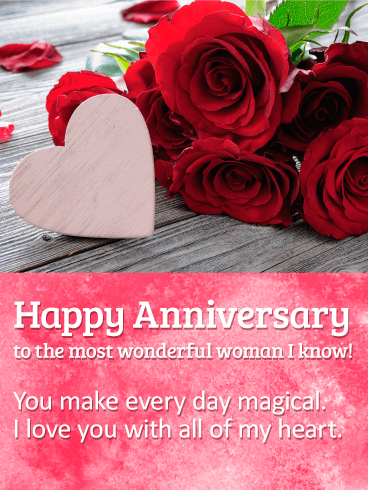 You can't go wrong with this anniversary card for the special woman in your life. The flowers are beautiful, and you can personalize the rest of the card to make it perfectly tailored to the woman you love. 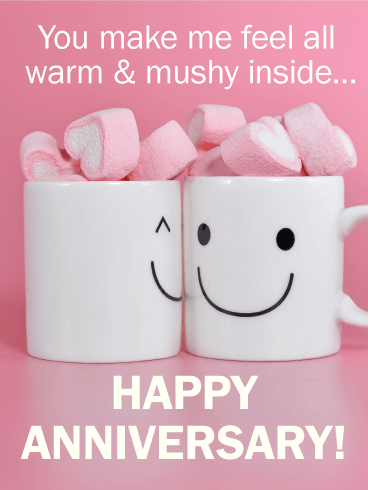 Isn't this anniversary card just the sweetest?! The heart vase is adorable, while the pink flowers just brighten your day. This is the perfect choice for the special lady who brightens your day. Let her know how much you mean to me. You can't even try to pretend you've seen a better and funnier anniversary card than this one! Dogs in their wedding outfits?! Absolutely precious! 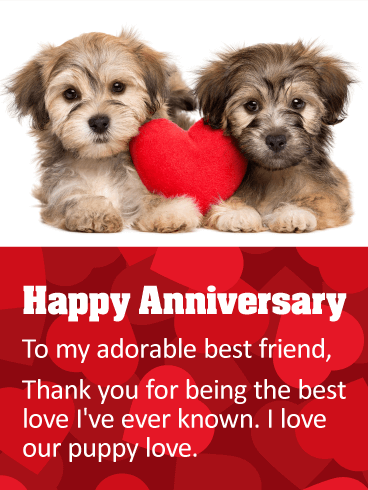 This is a must-have anniversary card for your dog-loving guy or girl. The "furrever" pun makes it all the more adorable and memorable. Is there anything sweeter than two adorable puppies... besides, of course, your significant other? This is the perfect choice for the dog-loving love in your life. The photo is sweet, the background is fun, and the emotion is sincere. 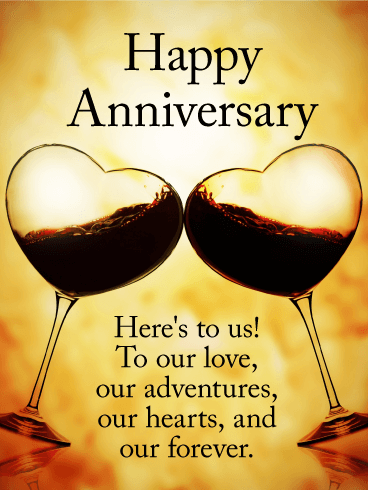 This anniversary card is the perfect combination of elegance and cuteness, and the heart-shaped wine glasses make this a great choice for that special someone in your life. The picture is breathtaking, and the heartfelt sentiment of the words is sure to make them smile. Raise a glass and drink to love! This intimate anniversary card says it all. Red roses, packages wrapped up tight, and sparkling champagne - all the ingredients for romance. 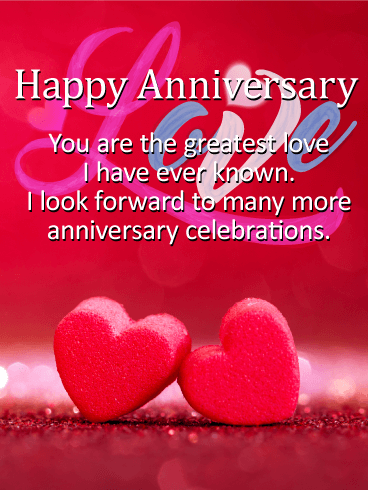 Let your love shine this anniversary and don't forget to send a loving card to your soul mate and special someone. Have a little bubbly, toast to each other, and laugh over all the good times you've shared. This is your special day. Make the most of it. Romance is in the air tonight! 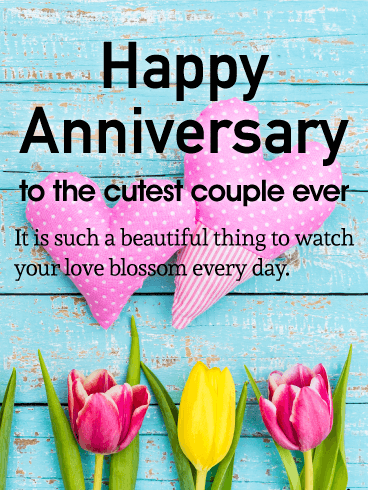 Do you know a wonderful couple celebrating their anniversary? 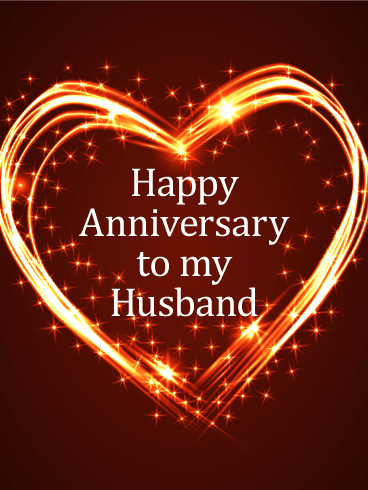 Let them know you believe in their love and wish them a happy anniversary now. 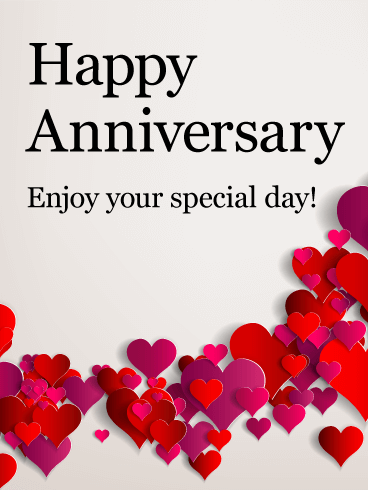 Sending an anniversary card is a simple and wonderful way to share thoughtful and heartfelt wishes. 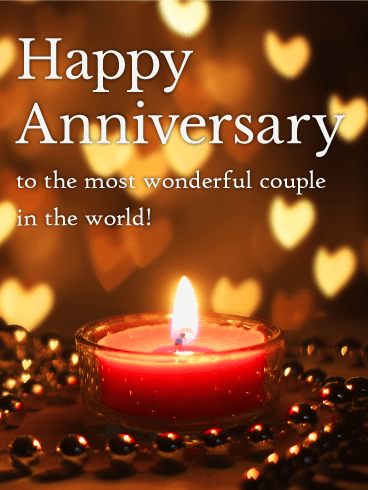 This anniversary card has warm candlelight with little hearts of light floating in the background for a very warm and intimate greeting that is sure to draw their smile. Take a stroll down memory lane this anniversary. You've been through everything together. 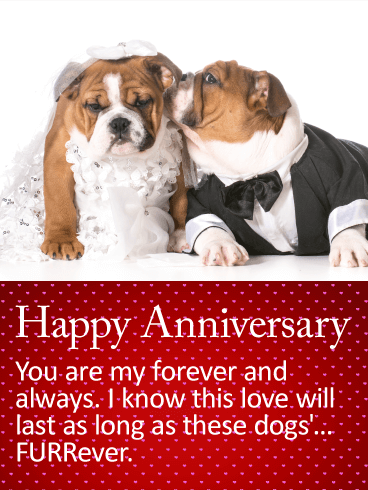 This anniversary card helps you remember cherish every moment. 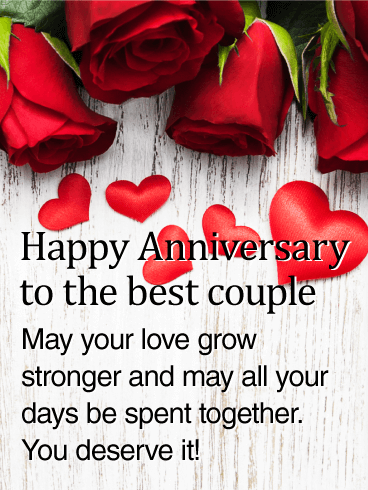 Wish happy anniversary to your soul mate and flood their life with love. This anniversary card features a stroll on the beach, a couple moving forward through life together. It represents your commitment to walk alongside each other for richer or for poorer, in sickness and in health, till death do you part.